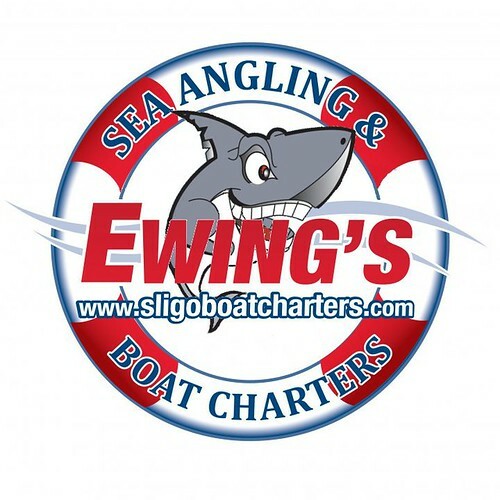 Sligo Bay on the Wild Atlantic Way holds good varied sea fishing grounds from hard reefs to rocks and sandbanks for world class inshore, offshore, light gear and game deep sea angling. Targeted game fishing for sea trout, big skate, tope, blue shark and Giant Bluefin Tuna is available whilst in season and evening mackerel trips depart daily by appointment. Other half day, full day and evening fishing trips are available to try catch some of Sligo Bays many varied species. Readily caught species include mackerel, pollack, coalfish, red, grey and tub gurnard, ballan and cuckoo wrasse, dogfish, cod, pouting, whiting, ling, all species ray, dab, plaice, sole, skate, tope and blue shark. To make the most of the ground, and depending on what you want to catch, we can either drift for game with or without the use of a drogue to slow us down to get the best out of the ground, or anchor up. Group and individual rates for full day, half day and evening trips. Large parties can be accommodated by splitting groups between multiple local boats. The various tackles, lures and equipment required for each species are available for hire on board (Shark/Skate/Giant Bluefin Tuna rods and reels at extra cost). Light gear angling in Sligo and Donegal Bay is superb with sometimes fish being caught every cast. Big pollack are especially great sport on light tackle, come try your luck and witness some screaming reels! Current Irish legislation does not allow for a recreational giant bluefin tuna fishery in Ireland (although we hope this will change shortly), but when it does, we have all the super big game rods, superb stand up gear, heavy duty reels and trawling gear at the ready! We also fish for big game blue shark (August to October), common or long nosed skate (we have caught these up to 220lbs), and big tope (end of May until mid August – we have many Irish specimen records and these generally weigh from 25-75 lbs). When fishing these species it is important that we pay particular attention to the tidal state in order to maximise the catch ratio, so please call to check tidal state when in season and arrange suitable times to charter the boat. It is also very important, that when fishing these species you choose a skipper with a proven track record, just check out our pictures! The tackle available for hire aboard includes some of the finest killer lures, rigs and terminal tackle bought from different suppliers around the world to ensure you use only the best gear. There are new abu garcia rods, paired with Penn reels and killer lures to ensure you get the best action from your fish. Lightweight & fun Powerbraid/WSB spin rods are paired with Shimano Gunship & Kastking reels, with various lures available in the cabin for some incredibly fun lightweight spinning action. Please remember to tell the skipper what you would like to catch – Sligo Bay holds good varied ground that is home to over 40 readily catchable species and skipper can advise as to what tackle/bait to use, stage of tide, time involved and the best methods to employ. The shark rods and reels are all 50lb class Penn and Hiro rods combined with Penn and Shimano big game reels with agepoche 8 strand braided/mono 65lb mainline and the captains custom made special shark traces. All bluefin tuna gear is custom made for the boat – trolling rods, stand up rods with full ball bearing rollers, momoi high catch and diamond braid combos, black magic fighting belts and all two speed shimano tiagra A130 and 80 reels. Lures are custom made bars, daisy chains, poppers and more, colours and shapes suiting what works in our particular areas. Sligo Bay boasts varied fishing grounds filled with plenty of species of fish. We have decades of experience and know the best spots for whatever you want to catch, from flatties to mackerel & shark! The skippers can also arrange to drop you off near some great pubs and restaurants, where you can “cook your catch” on the bbq yourself, or have a top chef cook your catch to perfection as a tasting platter/starter or a meal, and serve it to you whilst you unwind in idyllic surroundings.